Charlottesville, Va., September 22, 2016 – Founded in 2015, the Rivanna River Co. opened as Charlottesville's first paddlesports outfitting service. Owners and founders Gabe and Sonya "Sunny" Silver '99 were interested in not just sales, but also connecting the local community to the Rivanna River. In fact, they articulated their vision as "A healthy Rivanna River enjoyed, embraced, and valued by the people of Charlottesville." In fall 2016, the company partnered with Ms. Sarah Swain's Entrepreneurship and Problem Solving Senior Seminar. The partnership followed Gabe and Sunny's graduation from the Community Investment Collaborative (CIC) program in town. "From my professional development workshop on teaching entrepreneurship this summer, I learned that it is very important to have a kid-friendly business challenge to start off the year," said Swain. "Rivanna certainly qualified, and the students needed to fully experience their service to become market experts for them." 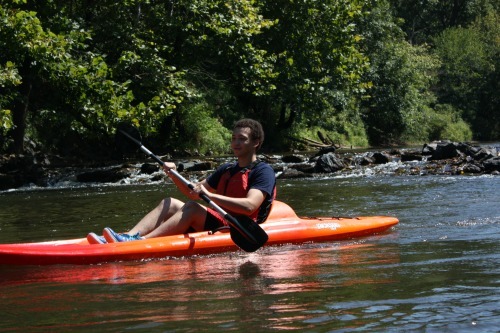 At the start of the course, the 14 seniors enjoyed a day on the river using Rivanna kayaks and gear to most fully understand the company's products, services, and ethos. Throughout the fall, students will work to help Rivanna River Co. generate ideas for expanding their weekday and shoulder season markets. The students will research options and interview potential customers as market research regarding attracting new market segments and developing new market channels. "We need to train today's students to create, not just replicate, copy, and follow instructions," noted Swain. "They are going to graduate and live in the real-world, so it only makes sense that they would begin that work here at the School."